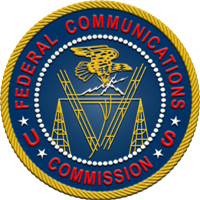 The FCC issued a Notice of Apparent Liability for Forfeiture and Order on May 14 in the amount of $18,000 to Nathaniel Johnson of Pittsburgh, Pennsylvania for failing to make his Citizens Band (CB) station available for inspection by the FCC and for failing to comply with the restricted hours of CB station operation. The base forfeiture amount for failure to allow inspection of radio equipment -- including a CB station -- is $7000. The FCC raised the forfeiture amount by $4000, as the nature of the violation is similar to failing to respond to a Commission communication. The FCC also found that Johnson's failure to permit a lawful inspection of his CB station -- after multiple notices directing him to do so -- justified a $7000 upward adjustment of the base amount for this violation, bringing the total amount to $18,000. The FCC noted that misconduct such as Johnson's "is serious, exhibits contempt for the Commission's authority, and threatens to compromise the Commission's ability to fully investigate violations of its rules. As such, we caution Mr Johnson that a failure to schedule an inspection as directed in this NAL may result in the imposition of additional (and potentially higher) forfeitures, as well as other enforcement actions, as appropriate, including the seizure of his equipment. Read more. 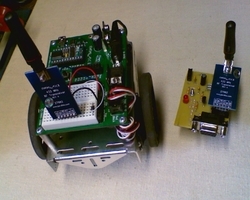 Students use APRS to remotely control a Boe-Bot robot rover as it "explores" an alien planet. Students can experience the same thrills as NASA scientists and engineers through a simulation that they conduct in their own classrooms. The Mars Lander Amateur Radio Robotics Exploration Activity (MAREA) is a robotic activity using ham radio. This affordable, powerful learning activity involves the same basic knowledge and skills that the professionals need to pilot the Curiosity robot as it collects and analyzes Martian soil samples and relays the results of these distant experiments back to Earth. MAREA is hands-on learning that integrates Science, Technology Engineering and Mathematics (STEM). MAREA uses robotic movement commands that are attached in the text portion of an Automatic Position Reporting System (APRS) packet transmission. The APRS packet with the attached commands is sent from a "mission control" school via the terrestrial APRS network or, when possible, even via the Amateur Radio station on the passing International Space Station, to a "ground station" school. At the ground station school the command packet is received and the command data is linked by UHF radio to the "Mars" robot for execution. Read more. 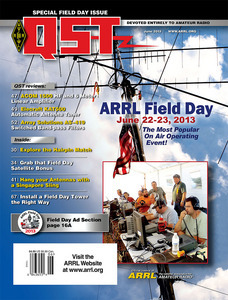 The June issue of QST -- our annual Field Day issue -- explores the fun and excitement of Amateur Radio's most popular operating event. So grab your print edition of QST -- or settle in with your computer or tablet to read the digital version -- and discover what the June issue has to offer. Bill Wortman, N6MW, knows that it can sometimes be difficult to achieve the desired 1:1 SWR between antennas and coax feed line. In his article "The Hairpin Match," he discusses how to match low impedance antennas to higher impedance feed lines with a simple impedance transforming method. Robert Wilson, NT0A, found that he was getting electromagnetic interference and radio frequency interference from unknown sources. Find out how diligent analysis -- including unplugging everything in the house -- revealed the culprit in "The Great RFI Hunt." Being able to monitor a battery in use during operation or while charging can be useful to make sure everything is working as it should. In his article "A Battery Monitor for 12 V Systems," Mert Nellis, W0UFO, presents a do-it-yourself project that lets you keep track of the status of storage batteries during Field Day. Last year, ARRL Eastern Pennsylvania Section Manager Bob Famiglio, K3RF, took to the air in a single-engine plane for Field Day -- and he plans to do it again this year! Read about Famiglio's adventure in "Field Day Flyover" by Bob Wilson, W3BIG. There are many ways to accrue points during Field Day. One way is to operate with fewer than 5 W, or QRP. In their article "Bagging the Field Day QRP Multiplier," Carey Fuller, KX0R, and Fred Maas, KT5X, explain that even though power is limited, the fun is not. Many of today's hams were first introduced to Amateur Radio when they were Boy Scouts. Today, through the BSA's National Jamboree and through Jamboree-on-the-Air (JOTA), thousands of young people all over the world find their voice on the air. BSA Director of Communication Services Jim Wilson, K5ND, invites readers to join Scouts on the air in his article "Jammin' and Hammin' with the Scouts." ARRL Membership and Volunteer Programs Assistant Manager Norm Fusaro, W3IZ, takes a look at the ACOM 1500 HF and 6 meter linear amplifier in this month's Product Review. He says this amplifier "delivers legal limit power on 160 through 6 meters and is quiet and easy to tune. The compact package will fit in most operating spaces." QST Contributing Editor Phil Salas, AD5X, checked out the Elecraft KAT500 automatic antenna tuner, saying that it "provides wide range automatic matching as well as a three-port antenna switch. It also works well with any transceiver and amplifier combination that doesn't exceed its specified power capability." QST Contributing Editor H. Ward Silver, N0AX, took the Array Solutions AS-419 switched band-pass filters for a test drive. He said that this accessory "offers a one-box solution to interstation interference in a multitransmitter station. Filters can be selected manually, or with a little work the Bandpasser can be controlled from the transceiver or station automation hardware." You can find a video overview of the ACOM 1500 HF and 6 meter linear amplifier, the Elecraft KAT500 automatic antenna tuner and the Array Solutions AS-419 switched band-pass filters in the digital edition of the June issue of QST. Of course, there are the usual columns you know and have come to expect in the June issue of QST: Happenings, Hints & Kinks, Amateur Radio World, The Doctor is In, Hands-On Radio, Short Takes, Vintage Radio, How's DX? and more. Look for your June issue in your mailbox and in your inbox. QST is the official journal of the ARRL, the national association for Amateur Radio. QST is just one of the many benefits of ARRL membership. Click here to join or to renew your ARRL membership. After much testing, the ARRL will release a new version of Trusted QSL, the open-source development project responsible for developing and maintaining the three Logbook of the World (LoTW) client-side applications: TQSL, TQSLCert and the TrustedQSL library. After six weeks of public beta testing, version 1.14 is ready for official release and will be available for download from the ARRL website beginning Monday, May 20. In December 2012, Dave Bernstein, AA6YQ, and Rick Murphy, K1MU, recruited a group of volunteer software developers to contribute to this project. After considering input from ARRL management and the ARRL's LoTW user support group in the League's Membership and Volunteer Services Department, as well as the ARRL-LoTW e-mail discussion group on Yahoo! Groups, the volunteer development group put forward a set of priorities that would be addressed by a sequence of incremental software releases. A small group of testers began exercising version 1.14 in March 2013; this testing exposed several defects, all of which have been corrected. Testing then progressed to an open beta test period that allowed interested parties to download, install and try out this newest version of Trusted QSL. Log files can be signed and uploaded over the internet to LoTW in one operation. Errors in Station Locations are reported (for example, incorrect CQ and ITU zones). QSOs that need not be re-submitted ("duplicates") are brought to the user's attention. Installation on Windows has been improved. Users are notified when a new version becomes available. Upgrading to version 1.14 is not mandatory, but is encouraged. Users who choose not to upgrade will not be able to access the new features in version 1.14, but they will still be able to upload logs into the LoTW system. At its annual meeting last month, the Yasme Foundation's Board of Directors elected Ward Silver, N0AX, as its new President. Silver will replace Wayne Mills, N7NG, who has resigned. Mills, one of the founders of DX University, was named as the new DX editor of CQ magazine earlier this year. In recognition of Mills' many years of service to the Yasme Foundation and DX University, the Yasme Board of Directors made a contribution to DX University in support of the goals shared by the two organizations. Read more. 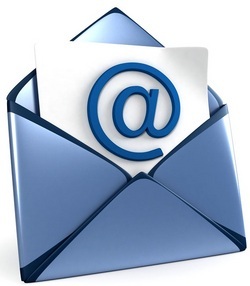 The ARRL's e-mail service provider is continuing to experience technical issues that are affecting timely delivery of e-mail messages sent via the arrl.net forwarding service, as well as e-mail sent to addresses in the arrl.org domain. This issue remains intermittent, but may result in delaying the delivery of some messages sent to both arrl.net and arrl.org addresses by hours. The ARRL's e-mail provider is working to resolve the issue as quickly as possible. We apologize for the inconvenience. The Sun, as seen on Thursday, May 16, 2013 from NASA's SOHO Extreme Ultraviolet Imaging Telescope. This MDI (Michelson Doppler Imager) image was taken in the continuum near the Ni I 6768 Angstrom line. The most prominent features are the sunspots. This is very much how the Sun looks in the visible range of the spectrum. Tad Cook, K7RA, reports: Since we are now at (or close to) the peak of Solar Cycle 24, it is no surprise that the solar indices are up. The latest forecast predicts Solar Cycle 24 to peak in this fall, but that will be determined after the fact, and it will be based on a long running average of sunspot numbers. This past week, the average daily sunspot numbers increased by more than 34 points, rising to 156.1, while the average daily solar flux was up by nearly 3 points to 140.1. 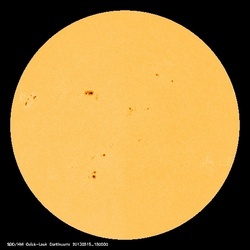 On May 15, the daily sunspot number was 186 -- the highest number since January 6-7, when the sunspot number was 186 and 196, respectively. The predicted solar flux for the near term is 145 on May 16-18, 140 on May 19, 135 on May 20-21, then 125, 140, 155, 160 and 170 on May 22-26, 160 on May 27-28, 155 on May 29-30, 150 and 155 on May 31-June 1, and rising to 160 on June 2-3. The predicted planetary A index is 8, 15 and 8 on May 16-18, 5 on May 19-20, 8 on May 21, 15 on May 22-23, 5 on May 24-27, 15 and 10 on May 28-29, 5 on May 30-June 8, and back up to 8 on June 9. Look for more information on the ARRL website on Friday, May 17. For more information concerning radio propagation, visit the ARRL Technical Information Service Propagation page. ARRL Headquarters will be closed Monday, May 27 in observance of the Memorial Day holiday. There will be no W1AW code practice or bulletin transmissions that day. ARRL Headquarters will reopen Tuesday, May 28 at 8 AM (EDT). We wish everyone a safe and enjoyable holiday weekend! 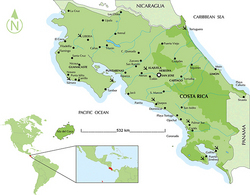 The February 1984 operation to TI9CCC (Cocos Island) has now been approved for DXCC credit. In the past, radio amateurs who have submitted this operation on a DXCC application had it rejected due to an "incorrect date period." According to DXCC Manager Bill Moore, NC1L, the date issue has now been resolved: "If you had this operation rejected, and your confirmation falls within February 15-28, 1984, please send an e-mail so you can be placed on the list for an update to your record." Prominent VHF/UHF/microwave enthusiast Mark Dabish, K8MD, of Howell, Michigan, passed away unexpectedly on May 8. He was 66. An ARRL member, Dabish represented the Great Lakes Division on the League's VHF/UHF Advisory Committee and was a strong presence in VHF/UHF contests. A service was held May 11 in Southfield, Michigan.